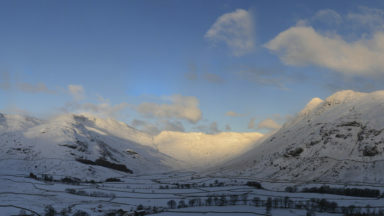 This route follows the ascent of the famous Wansfell Race, which is held annually the day after Boxing Day. 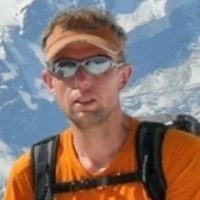 The amazing record of 18min 56sec has been held by Kenny Stuart since 1983 for the round trip to the summit: from the start at Bilbo’s Café to the finish at the old Kelsick Grammar School. 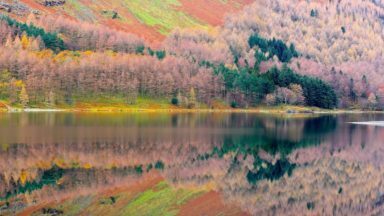 This route is much more than the Wansfell Race, as you explore the SE slopes heading into the Troutbeck valley, with stunning views down Windermere. 1 Turn L out of the pub and follow Stockghyll Lane up past Bilbo’s Café, then it curves R and ascends steeply past Stockghyll Force. Pass the old school and cross a cattle grid to leave the woodland behind. Follow the farm road for 250m until you see a footpath sign to Wansfell on the right. 2 Cross the stile over the wall and follow the path upwards. Find a sustainable running rhythm, as the ascent is very sustained. As you cross a small footbridge you leave the trees behind and emerge onto the upper fell. As the path crosses a gap in the wall the final section becomes rocky underfoot, and as you near the summit block the path veers around to the L before doubling back on itself to reach the top of Wansfell Pike. 3 Go through the black gate through the fence and continue SA on the path descending to the E. Be careful, as on this section of the descent there are often walkers ascending from Troutbeck. The steep trail soon eases off as you cross some boggy ground and reach the gate to enter the Nanny Lane track. Turn R and follow the walled path down into Troutbeck village. The lower section is running on loose gravel, so neat footwork is required, and there is a sharp R then L to enter a farmyard and the road. 4 Turn R along the road and follow it for 800m before turning off R just after the village store and post office, onto Robin Lane. This farm track heads steadily upwards. At the junction with the Hundreds Road, which joins from the R, run SA through the gate and along the trail and across a ford, to reach a farm track at the next gate. 5 Turn R and up the hill through the farmyard of High Skelghyll Farm, then onwards into Skelghyll Wood. The track becomes a little steeper in sections, and it’s often wet underfoot. Continue SA past Jenkin Crag and around the corner after the bridge over Stencher Beck. The trail emerges from the woods and follows a walled lane, with views down to the L to Waterhead. As you pass the house at Strawberry Bank the track turns to tarmac and descends into Ambleside. 6 When you reach Old Lake Road, turn R and run up it until it merges with Lake Road. Continue SA and after 200m you’ll see the White Lion pub straight ahead of you. 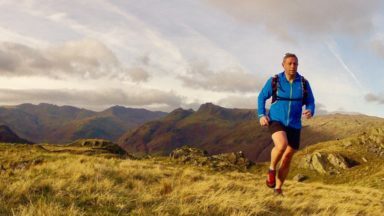 Kingsley's guidebook to Trail and Fell Running in the Lake District is published in April, by Cicerone Press and contains 40 of the best trail, fell and skyrunning routes in the Lake District, including Helvellyn skyline and Scafell Pike direct. 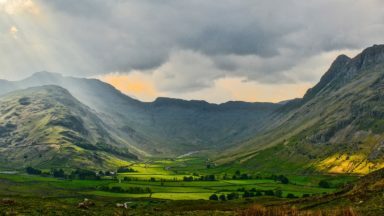 Highlights include recces of Cumbria's best ultra and fell race routes including the Langdale Horseshoe and Borrowdale. Includes info on the history of fell running, races and adapting for the fells. 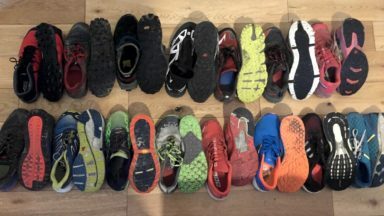 Shoes for fell running, trail running and road running - Do I have too many running shoes?